My first encounter with “pot de creme” was in high school. I was working a part-time job at a fancy tea store - and in exchange for university savings, I learned a ton about tea. And because tea is only made better with food, we also sold heaps of delicious treats, all stacked beautifully in a shiny glass case. There were warm scones, slices of cake, fluffy cream puffs - and perhaps my favorite of all: pot de creme. Translated literally, pot de creme means “pot of cream”. It’s a french custard, often flavored with chocolate, and baked in a water bath. I find it a bit denser than a mousse, in the best way possible. And to say it’s indulgent could even be an understatement. But it’s delightful. I remember always looking forward to when one of the little pots would pass its “sell by” date so that we could all dig in with little spoons. With the weather turning colder and rainier, we’ve been curling up with plenty of tea. And slowly, but surely, a craving for pot de creme came meandering back to me. Nowadays, a bowl comprised mostly of egg yolks and whipping cream doesn’t seem as delightful as it used to. But, I was totally up to the challenge of developing a more wholesome version that tasted every bit as delicious. And of course, we weren’t giving up on any of the chocolate. To celebrate the cooler months ahead of us, this recipe features a Chai flavored pot de creme. The warming spices provide a nice contrast to the chilled chocolate. It’s an easy twist that makes this treat feel even more special. While there are a number of ways to infuse chai flavoring, I landed on a simple blend of four spices - most of which are probably already sitting in your cupboard. The other method I tried was steeping tea bags. While the flavor was pretty good, it varied significantly by brand. But then, after a night of laying up at 3 AM still awake from the caffeine, I decided to scrap that plan altogether. I mean, I can’t be the only one who sneaks in some chocolate before bed?! As for assembling this dessert, it’s anything but fussy. The canned coconut milk, combined with melted chocolate, helps the dessert set beautifully in the fridge. So there’s no need whip up a water bath or even turn on the oven. All you need is a blender. To give this dessert some extra body, silken tofu lends a hand. It covertly provides the body that heavy cream and egg yolk usually give, with less of the yucky stuff and more protein to boot. Don’t worry, you can’t taste it - at all. If you’re new to buying silken tofu, then your safest best is at an Asian grocery store. Some more mainstream grocery stores sell it, but not always, so best to call and ask before making a trip. Make sure to read the labels thoroughly as silken tofu is not the same as soft tofu. 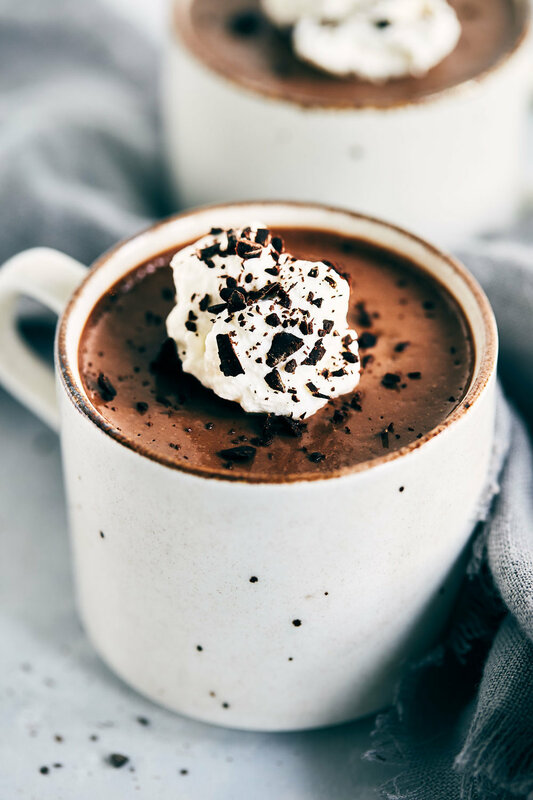 In case you’d prefer to make a plain chocolate pot de creme instead, I’ve included some instructions on how to do this below. All you’ll need to do is omit the ground spices (adding a splash of vanilla is optional). While you don’t absolutely need garnish, it does jazz it up. 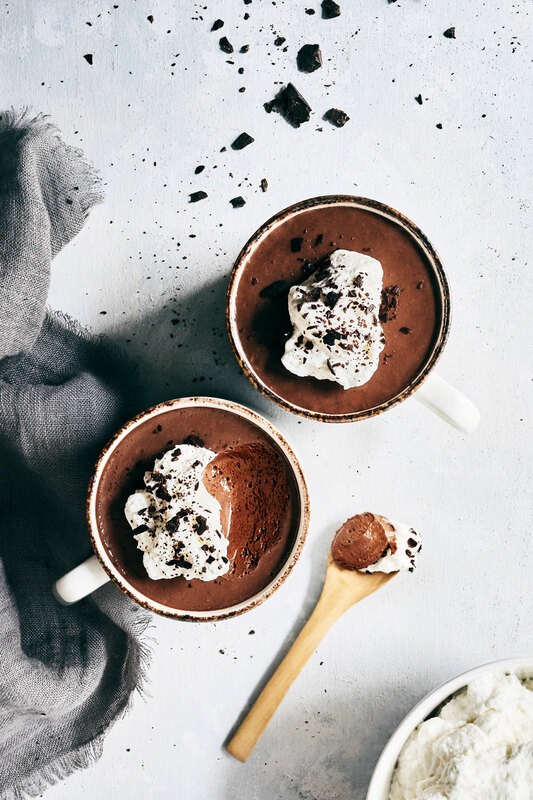 A small spoonful of coconut whipped cream and a shaving of chocolate works wonders. Store extras, covered, in the fridge. In a small pot, bring coconut milk to a simmer. While it heats, give the chocolate a rough chop. Once coconut milk is simmering, remove from heat. Add chopped chocolate, coconut sugar, cinnamon, ground ginger, cardamom, cloves and sea salt. Whisk until combined and chocolate is fully melted. Transfer the melted chocolate to a blender, alongside silken tofu and water. Blend until completely smooth, scraping down the sides of the blender once or twice. Divide mixture into 6-8 small containers (such as ramekins, cups, or bowls). Cover containers with lid or plastic wrap. Set in fridge to set (~4 hours). If garnishing, add a scoop of coconut whipped cream and garnish with shaved chocolate. -*I use 2 x 100 g good-quality dark chocolate bars. Most brands don't add dairy in these, but best to check labels if vegan / avoiding dairy. Approximately 1 1/2 cups chopped. -Recipe yields ~1 liter of pot de creme, which will make 6 x 3/4 cup servings, or 8 x 1/2 cup servings. -To make Chocolate Pot De Creme (no Chai), simply omit the spices (cinnamon, ginger, cardamom and cloves). You could substitute 1 1/2 teaspoons of vanilla extract, which works well with chocolate - or leave it out entirely. Follow all other steps and directions.